Click here for a printable pdf of Pregnancy and Lactation health topics. We recommend printing this out and keeping it handy! There are many different schools of thought about what is safe and what is not for baby and mother during pregnancy and lactation. At Selah we have decided to follow the advice given by Robert Tisserand and Rodney Young in their book, Essential Oil Safety (2nd edition), for many reasons. They are very conservative on their allowances, they have based their reasoning on sound research and testing and their information is the most up-to-date, as this book was published in 2014. These are the Selah Oils and Blends that should be avoided and used with caution during pregnancy. Remember, we are following Robert Tisserand and Rodney Young's safety information that can be found in their book, Essential Oil Safety, 2nd Edition (2014) on pages 152-156. If you use another brand of essential oils, check their safety before using. This list only applies to the items Selah Oils carries in their store. Anise, Birch, Carrot Seed, Cinnamon bark, Dalmation Sage, Fennel, Hyssop, Myrrh, Oregano, Spanish Sage, Tansy, Turmeric. "I have always believed that if peppermint oil was risky in pregnancy there would need to be warnings on peppermint-flavored gum and candy. There is evidence that menthol is safe in pregnancy (p 592 of my book) and there's none that I am aware of that either menthol or peppermint poses any risk. If others think differently, I don't know what their thinking is based on." *Never take essential oils internally when pregnant. *Never use an essential oil topically without dilution. *Never apply essential oils directly to the stomach when pregnant. *Only use the following suggestions with the approval of your doctor. *Be sure to always follow your doctor's advice. "Although photosensitizing oils are not a major problem in aromatherapy because possible ill effects are ineffective within 2 hours of administration, pregnant women should take extra care as they have an increased production of melanocytic hormone, which may make them more prone to being affected if the minimum waiting period of two hours is not observed before going into direct sunlight." Dilution guidelines: Click here for a handy dilution chart. 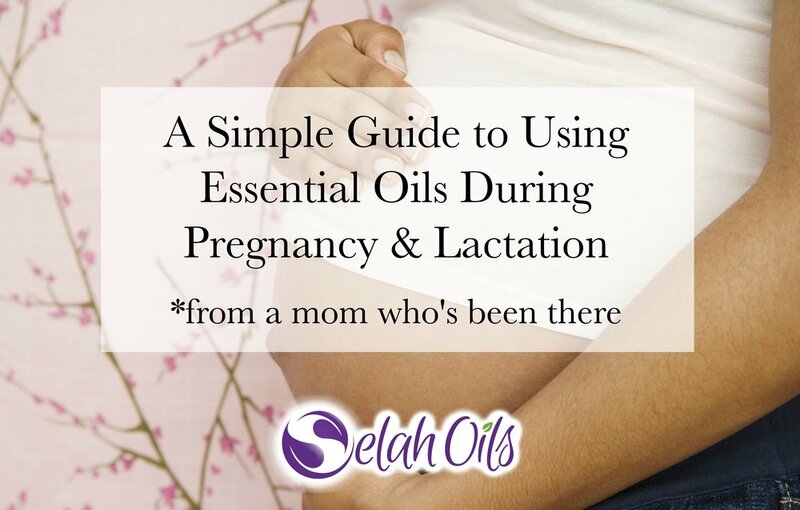 Our Selah Kids Collection of essential oil blends is safely pre-diluted and safe for use during pregnancy and lactation. Click here to learn more. Application ideas: Apply oil of choice on location. Application ideas: Dilute oil of choice as recommend and apply on location. Massage (diluted) into the mother's abdomen directly after birth. Dilute oil of choice and apply 1-2 drops to sinuses, bottoms of feet, chest or wrists. Diffuse (undiluted) into the air, or apply 1 drop to a cotton ball or tissue and breathe deeply. Application ideas: Dilute oil of choice and apply to bottoms of feet. Diffuse (undiluted) into the air, or apply 1 drop to a cotton ball or tissue and inhale. Dilute oil of choice and apply to back of neck, temples or bottoms of feet. Dilute and use as a massage oil. Add 1-2 drops chosen essential oil to 1/2 cup epsom salts and dissolve in warm bathwater. Arthritis: Bite Eraser, Clarify, Resting, Comfort, Jr. , Frankincense, Rosemary, Lemon, Cypress, BalsamFir, Basil, Cedarwood, clove, eucalyptus, ginger, Lavender, Resting, Peppermint, Pine, Roman Chamomile. Asthma: Breeze, Jr., Bite Eraser, Breeze, Comfort, Jr., Eucalyptus, Peppermint, Frankincense, Thyme linalool, Lemon, Pine, Cypress, Lavender, Rosemary, Roman Chamomile. Diffuse (undiluted) into air, or apply 1 drop to a cotton ball, tissue or pillow and inhale deeply. Athelete's Foot: Bite Eraser, Ease, Jr., Tea Tree, Cypress, Lavender, Thyme linalool. Bites (Insect, Mosquito): Bite Eraser, Lavender, Basil, Lemon, Thyme linalool. Bites (Spiders, Bee Stings, Ants, Fire Ants): Bite Eraser, Basil, Thyme linalool, Lavender, Lemon, Peppermint. Application ideas: Dilute oil of choice as recommend and apply on bottoms of feet. Boils: Bite Eraser, Clarify, Breeze, Tea Tree, Frankincense, Lavender, Lemon, Roman Chamomile. Bronchitis: Breeze, Jr., Armor, Jr., Bite Eraser, Comfort, Jr., Breathing, Breeze, Ease, Jr., Eucalyptus, Thyme linalool, Breathing, TeaTree, Breeze, Peppermint, Pine, Cedarwood, Rosemary, Cypress, Spearmint, Basil, Clove, Frankincense, Ginger, Lavender, Lemon, Roman Chamomile. Burns: Empower, Jr., Bite Eraser, Comfort, Jr., Ease, Jr., Lavender, Eucalyptus, Balsam Fir, Tea Tree, Peppermint, Roman Chamomile. Bursitis: Cypress, Ginger, Roman Chamomile. Calming: Resting,Jr., Bite Eraser, Quiescent, Resting, Sigh, Citrus, Lavender, Orange, Cedarwood, Frankincense. Dilute oil of choice as recommend and apply to back of neck, temples, chest, shoulders, wrists, back or bottoms of feet. Can dilute and use as a massage for back, shoulders, neck or arms. Dilute oil of choice as recommend and apply on location or bottoms of feet. Diffuse (undiluted) into the air or apply 1 drop to a cotton ball or tissue and inhale deeply. Click here for an additional blog post on the subject of Cancer and Essential Oils. Carpal Tunnel Syndrome: Empower, Jr., Bite Eraser, Comfort, Jr., Basil, Cypress, Eucalyptus, Lavender, Peppermint. Application ideas: Dilute oil of choice as recommend and massage on location. Colds: Armor, Jr., Breeze, Jr., Bite Eraser, Empower, Jr., Comfort, Jr., Breeze, Ease, Jr., TeaTree, Lemon, Rosemary, Thyme, Breeze, Basil, Copaiba, Eucalyptus, Ginger , Lavender, Orange, Peppermint, Pine. Diffuse (undiluted) into the air or apply 1 drop to a cotton ball or tissue and breathe deeply. Cold Sores: Bite Eraser, Clarify, Breeze, Ease, Jr., Tea Tree, Peppermint, Lavender, Lemon, Breeze, Roman Chamomile, Clove. Application ideas: Dilute oil of choice as recommend and apply to underarms. Depression: Resting,Jr., Bite Eraser, Quiescent, Resting, Lemon, Frankincense, Lavender, Rosemary, Rosewood, Grapefruit, Basil, Ginger, Patchouli, Cypress. Dilute oil of choice as recommend and massage into skin. Diffuse (undiluted) into the air or add 1 drop to a cotton ball or tissue and inhale deeply. Dilute oil of choice as recommend and apply on back, chest, feet or over pancreas. Diffuse (undiluted) into the air. Application ideas: Mix 15 drops of oil(s) to 50 ml (10 teaspoons) carrier oil (store in a glass container with lid) and massage the entire bottom of the foot to stimulate the digestive system. Digestive System, Gas/Flatulence: Tummy Troubles, Jr., Bite Eraser, Empower, Jr., Comfort, Jr., Ginger, Lavender, Peppermint, Cardamom, Coriander, Copaiba, Eucalyptus, Roman Chamomile, Rosemary, Spearmint. Application ideas: Dilute oil of choice as recommend and apply to large intestine, stomach, abdomen or feet. Application ideas: Dilute oil of choice as recommend and apply to mastoid bone behind the ear. Edema - Grapefruit, Cypress, Lemon, Cedarwood. Application ideas: Massage ankles and legs with long upward strokes, moving away from the ankles. Emotions, Mood Swings - Bite Eraser, Citrus, Lavender, Geranium, Sandalwood. Emotions, Antidepressant - Citrus, Geranium, Frankincense. Emotions, Sedative / Calming - Resting,Jr., Bite Eraser, Lavender, Vetiver. Application ideas: Dilute oil of choice as recommend and apply to temples. Fever: Armor, Jr., Breeze, Jr., Bite Eraser, Empower, Jr., Comfort, Jr., Ease, Jr., Peppermint, Frankincense, Lemon, Eucalyptus, Clove, Basil, Ginger, Lavender, Tea Tree, Spearmint. Dilute oil of choice as recommend and apply to bottoms of feet or spine. Diffuse (undiluted) in the air. Focus: Bite Eraser, Lavender, Vetiver. Dilute oil of choice as recommend and apply to feet, temples or back of neck. Bite Eraser, Ease, Jr., Rosemary, Lavender, TeaTree, Basil, Cedarwood, Cypress, Patchouli, Thyme. Application ideas: Dilute oil of choice as recommend and massage into scalp before shampooing. Hair, Itching: Bite Eraser, Peppermint, Lavender. Hair, Loss: Bite Eraser, Rosemary, Lavender, Cedarwood, Thyme, Cypress, Lemon, Roman Chamomile. Application ideas: Massage or a small compress on the head, back of neck and shoulders with essential oils in a carrier. Application ideas: Apply topically with carrier to chest area. Use aloe vera gel as a base for the essential oils before applying. Spending about 10 minutes in a sitz bath with essential oils (2 drops essential oil with 1 cup epsom salt). You can also make a compress. In a bowl of warm water, mix 1 drop essential oil. Wet a cloth and wring it out and apply. Hives: Bite Eraser, Ease, Jr., Tea Tree, Peppermint, Lavender, Patchouli, Roman Chamomile. Application Ideas: Dilute as recommend and massage over breast and on feet. *Do not use Fennel for more than 10 days at a time as it will largely increase the flow through the urinary tract. Influenza: Armor, Jr., Breeze, Jr., Bite Eraser, Empower, Jr., Comfort, Jr., Breeze, Ease, Jr., TeaTree, Peppermint, Rosemary, Eucalyptus Radiata, Clove, Copaiba, Ginger, Lavender, Orange, Pine, Thyme. Insomnia: Bite Eraser, Quiescent, Citrus, Resting, Lavender, Frankincense, Orange, cypress, Basil, Lemon, Roman Chamomile, Rosemary. Dilute oil of choice as recommend and apply to bottoms of feet or back of neck. Add 1-2 drops to bathwater and bathe. Diffuse (undiluted) into the air or place 1-2 drops on a pillow. Lice: Bite Eraser, Empower, Jr., Comfort, Jr., Ease, Jr., Tea Tree, Citronella, Pine, Eucalyptus, Lavender, Lemon, Rosemary. Application ideas: Dilute oil of choice as recommend and apply to scalp and to bottoms of feet three times a day. Application ideas: Dilute oil of choice as recommend and massage breasts immediately after feeding baby. Wipe breasts clean prior to next feeding. Place 2-3 drops essential oil on a tissue or cotton ball and inhale deeply three times. A bath with 3 drops essential oil mixed in 1 cup of epsom salts - swish well before entering. 50 ml (10 teaspoons) carrier oil mixed with 3 drops essential oil for massage. Dilute oil of choice as recommend and apply to chest, back, or bottoms of the feet. Can apply as a warm compress to the chest. Diffuse (undiluted) into the air or apply 1 drop to a cotton ball or tissue and inhale deeply. Place 4 drops in 1/2 cup hot water and inhale steam vapors deeply. Poison Oak/Ivy: because essential oils are so easily absorbed into the blood stream, they are not recommended for use when treating poison ivy. The essential oils pull in the toxic urushiol oil (the oil from the poison ivy plant that remains on the skin and causes the rash) into the bloodstream along with them. Scabies: Tea Tree, Clove, Lemon, Rosemary. Shingles: Bite Eraser, Empower, Jr., Comfort, Jr., Breeze, Ease, Jr., Tea Tree, Eucalyptus, Lavender, Lemon, Roman Chamomile. Dilute oil of choice as recommend and apply sides of nose or on forehead (avoid eyes). Skin Problems, Acne or oily skin - Skin Soothe, Jr., Cedarwood, Lemon, Tea Tree, Geranium, Patchouli. Application ideas: Dilute oil of choice as recommended and apply to location. Skin Problems, Stretch marks - Skin Soothe, Jr., Soft Spray, Bite Eraser, Frankincense, Lavender, Patchouli. Application ideas: Mix 8 drops of each (Frankincense, Lavender, Patchouli) with 75ml (15 teaspoons) sweet almond oil and 25ml (5 teaspoons) carrier oil. Store in a glass container with a lid and apply every morning and evening. Dilute oil of choice as recommend and apply to bottoms of feet or back of neck. Add 1-2 drops to epsom salts and bathe. Armor, Jr., Bite Eraser, Empower, Jr., Comfort, Jr., Breeze, Ease, Jr., TeaTree, Peppermint, Spearmint, Clove, Eucalyptus Radiata, Grapefruit, Lavender, Orange, Patchouli, Thyme, Cypress. Dilute oil of choice as recommended and apply to throat, lungs or bottoms of feet. Sunburn: Bite Eraser, Ease, Jr., Lavender, Peppermint, Tea Tree. Dilute oil of choice as recommended with water and apply or spray to location for first 24 hours. After first 24 hours, dilute with carrier oil and apply on location as needed. Application ideas: Dilute oil(s) of choice and apply to bottoms of feet. AromaTools. Modern Essentials, Fifth Edition, (2013). Berwick, Ann. Holistic Aromatherapy. (1994). Buckle, Jane. Clinical Aromatherapy Essential Oils in Practice, 2nd Edition. (2003). Davis, Patricia. Aromatherapy An A-Z. (2000). Higley, Conie & Alan. Reference Guide to Essential Oils. (2012). Lawless, Julia. The Encyclopedia of Essential Oils. (2013). Price, Shirley & Len. Aromatherapy for Health Professionals. (2012). Rose, Jeanne. 375 Essential Oils and Hydrosols. (1999). Rose, Jeanne. The Aromatherapy Book. (1992). Schnaubelt, Kurt Ph.D. The Healing Intelligence of Essential Oils. (2011). Schnaubelt, Kurt, PhD. Advanced Aromatherapy, (1995). Tisserand, Robert & Young, Rodney. Essential Oil Safety, 2nd Edition. (2014). Worwood, Valerie. The Complete Book of Essential Oils and Aromatherapy. (1991).